Israel's Shin Bet domestic intelligence agency last week announced that it had foiled an extraordinarily dangerous secret terrorist network that Hamas was building in the West Bank. The network was unusually alarming due to the scope of damage it sought to cause. Hamas wanted to launch bomb attacks on Israeli cities, targeting shopping centers, hotels, restaurants, trains, and buses. The scope of damage being planned by the cell exceeded the potential harm that previous Hamas cells had plotted in recent years, Shin Bet found. The attacks were to have started in early October, but Shin Bet stepped in before then. In addition, Hamas planned use the cell to strike crowded targets in Israel in conjunction with one of the recent escalations in violence between Gazan terrorist factions and Israel. This would have created a two front challenge for Israel, dramatically escalating the situation, and could have contributed to Hamas's goal of gaining a 'victory picture' during one of those escalations. Another unusual feature of this cell was the fact that it was orchestrated directly by Hamas's military wing command headquarters in the Gaza Strip. Previously, West Bank cells were remotely managed by Hamas operatives who originally hailed from the West Bank and were released in the 2011 Shalit prisoner exchange deal with Israel. Hamas's military wing in Gaza embarked on an intense West Bank recruitment drive, using video chats to train terrorist recruits on how to prepare explosives, and how to select crowded targets for the planned atrocities. According to the Shin Bet, the explosives that the recruits were learning to use were highly advanced, and more powerful than any kind of bomb plots that had formed in the West Bank to date. Gaza and Israel have been on the brink of conflict since Hamas began organizing mass riots and infiltration attempts on the Gaza-Israel border in March. During flare ups, it engaged in intense rocket fire on Israeli civilians, drawing Israeli Air Force retaliatory strikes during rounds of fighting throughout the summer and early fall. Hamas, Palestinian Islamic Jihad, and others fired approximately 460 projectiles into southern Israel Nov. 12-13, raining down the most intense volley of rockets on southern Israeli civilians seen in 24 hours. Israel's Iron Dome air defense system intercepted about 100 rockets heading for populated areas. The latest Gazan rocket attacks killed a Palestinian construction worker in the Israeli city of Ashkelon, and critically injured an Israeli woman. An additional 50 Israelis were injured in the attacks, most sustaining light shrapnel wounds. Most of the rocket fire was directed against Israeli villages situated nearby the Gaza Strip, reflecting Hamas's desire to control the escalation, and reserve an ability to dial down the attacks, while also threatening longer-range rocket strikes on more distant Israeli cities. It was during such an escalation that Hamas had hoped to activate 'the West Bank front,' and destabilize the region. Interrogations of the suspects "revealed that Hamas in Gaza pressed the West Bank operatives to carry out the attacks as soon as possible," the Shin Bet said in a statement. The Shin Bet stressed that the latest terrorist cell "is different to known Hamas efforts in recent years, in its scope and potential for danger." Had the cell been able to pounce, the scope of its attacks would have created a "a new reality," the intelligence agency warned. In order to communicate with the West Bank recruits, Hamas exploited Gazan civilians who received permits for live-saving Israeli hospital care, as well as other civilians who received permits to enter Israel for meetings with business partners in the West Bank, the investigation found. The civilians "were asked" to deliver messages and instructions to the West Bank terror cell recruits, according to the Shin Bet. "This is not the first time that Hamas is exploiting the humanitarian field in order to realize military activities in Judea and Samaria [the West Bank]," the Shin Bet said. The September arrest of a 25-year-old Hamas member Awis Rajoub, who is a resident of the town of Dura near Hebron, led to a breakthrough that uncovered the plot. Rajoub was arrested for allegedly carrying out missions for Hamas after he informed "a number of his friends and relatives about his terrorist activities, and involved them in purchases of means designated for the preparation of explosive devices," Shin Bet said. The recruitment process began when a Gazan operative invited Rajoub to join the Hamas military wing and trained him in making remote controlled bombs. Rajoub received instructions from his Gaza handler in August, telling him to go to a medicine storage facility in Ramallah to pick up a cell phone, in order to continue communications. Rajoub allegedly recruited two Hamas members from the village of Beit Kahil, near Hebron, who were told to identify targets in Israel and prepare the bombs. Hamas in Gaza told Rajoub to complete the cell's preparations by the end of September, and to conduct the attack at the start of October. Rajoub's handler then informed him to expect a meeting with an elderly Gazan woman, who received an Israeli permit to cross into Israel for medical treatment. That meeting occurred in the West Bank city of Bethlehem. The woman passed on a pair of pants to Rajoub, which had instructions for activating the cell phone sewn into a cloth strip. He then communicated with his Gaza handlers with the phone, receiving video instructions and video chats with a Gazan bomb assembly expert, according to the investigation. The depth of Hamas's West Bank cell-building activities became clearer when the Shin Bet learned that Hamas dispatched two Gazan women, one who was receiving cancer treatment, and her sister, a mother of nine, to a café in West Bank city of Ramallah. In that café, Hamas member Fouad Dar Khalil, who had served 14 years in an Israeli prison for a previous gun attack on an Israeli vehicle, and for plotting other attacks, had been working. The Gazan women passed on a suitcase with a hidden letter from the Hamas military wing. The Shin Bet said the sisters' departure from Gaza and transfer of the secret message "was carried with the coordination, and under the guidance, of their cousin, Muhammad Abu Kwaik, 36, a Hamas military wing operative, who is known to be in contact with terrorists and to assist them in their operations." The Shin Bet arrested Khalil in mid-October. The investigation "revealed the two women were aware of the contents of the suitcase," the Shin Bet said. During questioning, the women said they were sent to the West Bank on behalf of a Gazan Hamas militant named Ashraf Sabah, 37, who had served 12 years in an Israeli prison for severe terrorist offenses. Sabah was behind the recruitment and handling of Dar Khalil, the Shin Bet found. 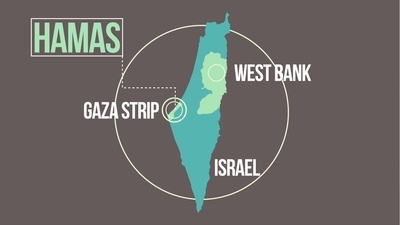 A 'West Bank HQ' operates within the Hamas military wing in Gaza, which orchestrates Hamas activities and ultimately tries to undermine regional security with mass casualty terrorism. Hamas's headquarters in Lebanon, under the command of Salah al-Arouri, as well as branches in Turkey, have all been involved in past attempts to create terrorist cells in the West Bank – all stopped by Israel. Earlier this month, Shin Bet's chief Nadav Argaman announced that Israel thwarted 480 significant attacks in 2018 so far, including 280 shootings, 76 bomb attacks, six suicide bombings, and seven kidnapping plots. Israel broke up 220 West Bank Hamas terrorist cells this year. Despite these figures, the latest cell to be exposed and broken up posed an even bigger than normal threat, and serves as the latest cautionary tale of Hamas's unending efforts to use the West Bank as a launching pad for murderous terrorism. The numbers provide a staggering reminder of the extent of the security threat Israel faces, and how deceptive the routine quiet really is. A Shin Bet official described the latest plot as part of a "long series of attempts" by Hamas to recruiting terrorists in the West Bank and direct attacks. Hundreds of suspects in the West Bank, including students and young women, have been arrested as part of the Shin Bet's counter-terrorism investigations, meaning that Hamas has harmed the "fabric of life of Palestinians" in the West Bank, the official said, by enticing them into terrorism, leading to their arrest and lengthy incarceration. Despite the multiple failures in conducting such attacks, Hamas continues to try, the official said, reflecting a strategy chosen by Hamas's leadership to destabilize the West Bank "at any price." This activity "constitutes a central and dangerous element for instability and is an immediate and substantial threat to the region," the official added.